If driving isn’t fun for you, then you’re doing it wrong! The new 2017 Ford Fiesta is one fun ride, adding a bright splash of colour, pint-sized peppy power, and that sporty hatchback driving sensation that is often forgotten or overlooked in the larger car segments. And now it’s made its arrival here in Humboldt, Saskatchewan, at Discovery Ford Sales. What else is there to get excited about with the new Fiesta? With three engine options, a can’t-beat price ticket, and one of the best fuel efficiencies beyond the bicycle, you don’t need to look far to be won over by the vehicle equivalent of Spring. Want to test out the new 2017 Fiesta on the road? Come in to Discovery Ford Sales to make friends with this perky subcompact hatchback. 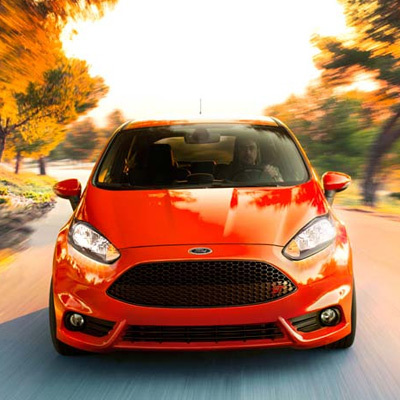 We carry plenty of both new and used models, across many different trims, including the popular Fiesta ST hatchback, making us an attractive destination for out-of-town shoppers from nearby Englefeld, Muenster, and Watson, Saskatchewan. Like three very different siblings sharing a resemblance and the family name, the new 2017 Fiesta offers three engine options for three very different drive modes. The standard 1.6L four-cylinder gives you an optional 6-speed “Powershift” automatic transmission. The fuel-sipping 1.0L EcoBoost delivers a mind-boggling 5.5L/100km (51 mpg) of fuel economy on the highways, and a stellar 38 mpg (7.5L/100km) in the city, while still popping out 120 horsepower and 125 lb-ft of torque. Lastly, the sport Fiesta ST delivers a horse-happy 197 hp and 202 lb-ft of torque from its turbocharged 1.6L engine; conquer hills with its 6-speed manual transmission. See our online showroom for full engine specs. Long-lasting satisfaction all starts with a strong foundation. The new 2017 Ford Fiesta takes care of the basics, with power locks and mirrors, A/C, and a six-speaker stereo with iPod/USB interface. But don’t be fooled into thinking this is just a Ford entry-level vehicle: the top Titanium trim adds rearview camera, chrome cladding, keyless ignition, heated leather front seats, and many more lavish touches that a guy or girl could get used to. You might still need to rent a truck to haul your sofa, but the 26 cubic feet of available storage is more than enough for the great majority of your daily doings. Small and spritely doesn’t have to mean unsafe! Case in point: the new 2017 Ford Fiesta, which comes standard with both front and rear ABS, stability and traction control, full airbag complement, and other handy visibility-raising features, like the integrated blind-spot mirrors that will help you make lane changes with more confidence. The SE trim also makes Ford’s MyKey system standard for 2017: a smart technology suite that can also let you set speed and stereo volume limits for those who borrow your wheels. Keep your Fiesta from someday taking the ultimate siesta by using nothing but the best Ford OEM parts and accessories, available for order online here at Discovery Ford Sales. Whether you are looking for stylish aesthetic touches to let everyone know your ST model is not to be overlooked, or wheels and rims suited to match your sport-tuned suspension, there is something for every Fiesta in our Parts Department.